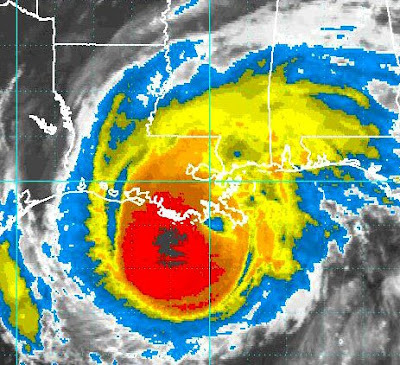 As Hurricane Gustav bears down on the Gulf Coast, millions of people have been forced to flee their homes. One of those people is Lattimore Brown. Repeated phone calls to the hotel that FEMA has placed him in down in Biloxi yesterday went unanswered. The desk manager told me that everyone in the hotel was being evacuated by 2 pm. 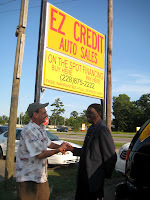 When Katrina hit, Lattimore's van, on which he only had one more payment, had been 'locked down' (immobilized by the Repo Men) because the payment was late. As we've mentioned before, he gets his VA check on the first of the month, and was going to make the payment on September 1st. Katrina hit on August 29th. Unable to drive, he was forced to send his wife on a bus trip from which she would never return. The van was washed away by the storm. Insurance didn't cover that kind of catastrophic loss. It was gone. Eventually, Lattimore was able to get another minivan from the same car lot that sold him the first one. 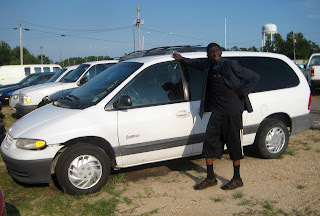 When we got there in June, he told us that that van had been stolen from the parking lot of a Winn-Dixie in Gulfport, and he had to walk over 15 miles back to the FEMA trailer he was living in, sleeping that night on the side of the road. He reported the van stolen, and never heard another word from the police. Literally stranded, he now had to travel everywhere on foot. When we got back from Memphis, He asked me to drive him over to the car lot, so he could try and work out some kind of deal to get back on the road. Lo and behold, the stolen van was there. As it turned out, the police had found it just a few days after it had been taken, but had no address for Lattimore as this was around the same time that FEMA had shut the trailers down, and moved him to the hotel. The van sat in the impound lot until they finally traced the lien-holder on the vehicle, which was the car lot. According to them, they had to pay over $500 in fees to the city to get the vehicle released. Before they would give it back to Lattimore, they told him he'd have to pay that, along with the car loan payments he had missed. On the first of July, he did just that so he could get back on the road. The car, though, had some serious electrical problems, and he had to pay to try and get those fixed... with the price of gas the way it is, it wasn't long before he was broke again. When I spoke with him last week, he told me that they had come and locked down the van once more, and that he was waiting until September 1st so he could afford to pay the note and get his car back... only he was forced to evacuate yesterday, August 31st. Faced once again with the same impossible situation, did he decide to get on the bus - the same bus that took his wife away for the last time - or try and weather the storm somewhere on the streets of Biloxi? God bless you Lattimore Brown, wherever you are. Keep us up to date when you know something, Red. Lattimore's story is incredible...thanks for sharing. This just infuriates and deeply saddens me. Discovered Lattimore Brown through you and Funky16Corners and he is a treasure that should be honored. Just bought Please, Please Please @amazonmp3 in hopes in some small way it will help him and plan to write a post to promote him for others to buy(although I'm sure his cut from each sale is most likely paltry). Thanks Red for keeping us posted. I was thinking about him when the news was breaking about the hurricane. I concur with your sentiment here and I look forward to an update should you succeed in hearing from him.